Monica Virtue is still available for bookings. Her modified workshops, called “Visualizing the Treaties,” use maps, counter-mapping, diagrams, photos and videos to help explain cession treaties and the Indian Act. You can enquire about booking Monica by using the contact form below. 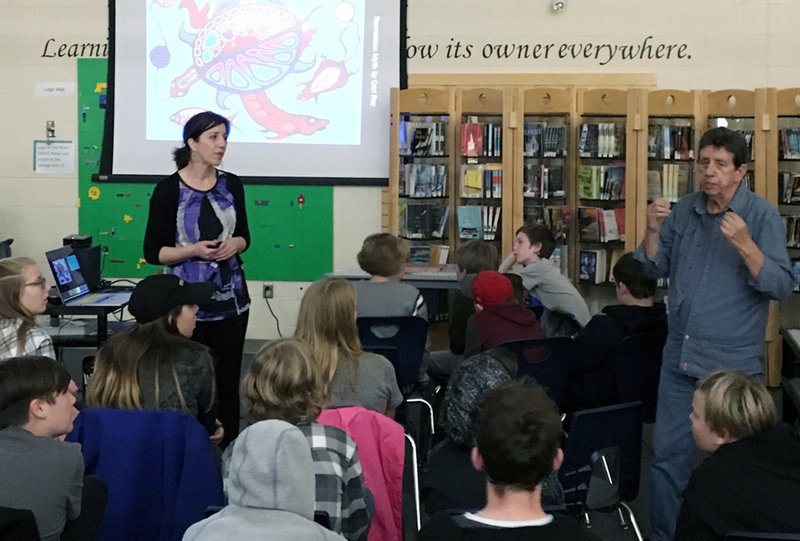 Anishnaabe author David D Plain, from the Aamjiwnaang First Nation, and filmmaker/researcher Monica Virtue have partnered to bring Treaty Workshops to local schools, municipalities, First Nations and other community groups. The workshops feature custom agendas that target both Indigenous and non-Indigenous participants of all ages and fuse traditional oral storytelling with interactive mapping, animations, and videos. The two discuss wampum treaties, cession treaties, and the various ways the treaties were broken. The goal of the workshops is to “connect the dots” between historical events of the past, the Canadian legal system, and present-day issues which teachers may find themselves discussing with their students. how they can influence our world views when it comes to understanding treaties. David’s voice is predominant in the first half of the workshops as he discusses Indigenous spirituality, ceremonies, and traditions before leading into waterways and canoe routes. While David tells the Anishnaabeg migration story and later struggles with other contending First Nations and colonial powers, Monica maps his story in real-time using Google Earth. David then discusses various wars and the different wampum exchanged to end them, sharing physical items like a replica Two Row wampum and a calumet. between nations, Monica pins significant sites to the map using Google Earth. Monica uses maps to explain colonization through the land agreements known as cession or “surrender” treaties. She discusses the ways the Department of Indian Affairs broke the treaties, such as through Indian Act surrenders, the Oliver Act, and enfranchisement. Data visualization is used to explain complicated concepts, such as Aboriginal title and the structure of the Department of Indian Affairs. Equal weight is given to both Indigenous and non-Indigenous knowledge, with comparisons drawn between worldviews as told through the Anishnaabe and Western creation stories. Monica often refers back to David’s portion of the workshop to stress how archival research and traditional knowledge can dovetail and support each other. The workshops end with the topic of de-colonization, reconciliation and world building. As attendees leave the workshops, David and Monica encourage them to carry the spirit of the original intent of the treaties out into the world with them. One way this is achieved is through an earlier activity that involves the explanation of the word daawed, which in Anishnaabemowin means a “reciprocal trade.” While David explains the meaning of daawed, Monica distributes a small bag containing two pieces of candy (such as a lollipop) to half of the attendees. After distributing the candy, Monica asks those who have a surplus to decide if they’d like to keep it for themselves or if they’d like to share their surplus with those around them. Once the attendees begin opening their candy bags, it is explained that those who are sharing with their neighbours likely hold an Indigenous worldview, while those who hoard their candy for themselves are likely holding a colonized or Western worldview. This activity has an emotional impact on the participants, and they are encouraged to communicate what they have learned on social media so that teachers can track the discussions of their students and the public can learn from those who now have a deeper understanding the treaties and the meaning behind them. Workshops can be modified to reflect the territory in which they are held, and David and Monica welcome Indigenous attendees from that territory to share their knowledge to their understandings dovetail with that of the presenters. Workshops are also age-specific, whether designed as one, two and three-day training sessions for high school teachers or as two-hour intensives for students from Grades 6 to 8. 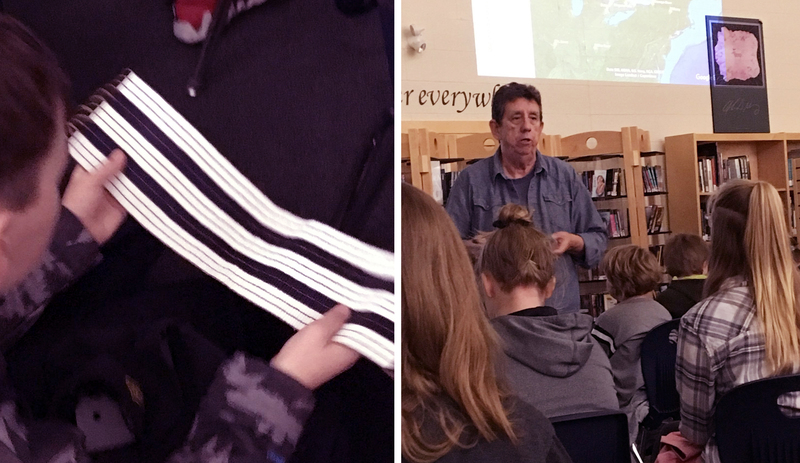 Having the authentic information provided by David and Monica in an engaging, age appropriate manner enabled our students to connect their in-class learning to that of real life explanations and situations. Collectively, it has changed our thinking, perceptions, and future actions for the better. David D Plain is an award-winning indigenous historian/author and gifted speaker. His books have received critical acclaim with The Plains of Aamjiwnaangwinning a Golden Scribe Award in 2008. It was also shortlisted for an Eric Hoffer award in 2014. He has published five titles in all with Gold Seals for Literary Excellence awarded to four of them. David is a member of Aamjiwnaang First Nation and has fully researched his nation’s history and culture. David has also been privy to the tutelage of the elders of the community. These sources have produced books on Ojibwa history and culture that are of the highest quality. David published Poems From An Eclectic Mind in 2016. He has also co-authored the screenplay for the pilot episode of Three Fires, a one-hour TV drama series based on his book 1300 Moons. His latest non-fiction book, A Brief History of the Saugeen Peninsula will be released in June 2018. David holds a Bachelor of Religious Studies degree. He also graduated from Tyndale Seminary earning a Master of Theological Studies degree. David passes around a replica Two Row wampum and discusses its meaning. Photo: Brantford Collegiate Institute Library, @BCI_Library. Monica Virtue is a settler from Woodstock, Ontario. From 2005 to 2012 she conducted archival research for Klippensteins, the law firm that represented the Estate of Dudley George during the 8-year George vs. Harris civil suit and the Ipperwash Inquiry. Monica was initially asked to direct an educational documentary on the history of the Ipperwash Provincial Park lands, but the film soon grew into a 7-year research project focusing on the impacts of local treaties and the Indian Act. Since then she has conducted co-designed research using counter-mapping techniques and GIS technology. She currently works with the Public Visualization Lab at OCAD University, developing a 360-degree documentary project and researching alternative ways of learning about treaties using digital mapping. Monica holds a BA in Communication Studies, a certificate in business, a post-graduate certificate in Advanced Television & Film, and graduated from OCAD University in 2016 with a Master of Design in Digital Futures. Western world view, cession treaties and Indian Act land surrenders. While Monica has long tapped into David’s knowledge for her various Ipperwash-related projects, the two had not formally collaborated together until July 2017 when Aamjiwnaang Heritage & Culture: E’Maawizidijig asked them to present together for “Treaty Day.” Realizing that their respective knowledge bases complemented each other perfectly, they soon partnered on a two-day training workshop for a local school board. Since then, they have booked longer training workshops with other school boards, and shorter workshops with university, high school and elementary students, and with public libraries. To request an agenda for the Lambton-Kent region, along with an estimate for an appropriate length of workshop for your audience, please fill out the form below. Monica will respond within 5 to 7 business days.